Capcom is celebrating a lot this year, with the company itself reaching its 30th anniversary and Mega Man hitting his 25th birthday. While the Blue Bomber hasn't had a new game to celebrate the occasion, he is to be a playable character in the upcoming Super Smash Bros. on Wii U and 3DS and there are a selection of classic Game Boy titles heading to the 3DS Virtual Console at some point. Mega Man II, Mega Man III, Mega Man IV and Mega Man V are all on the way, while Game Boy Color titles Mega Man Xtreme and Mega Man Xtreme 2 are also in the pipeline. These are just a handful of titles in Nintendo's busy Virtual Console schedule. There are new titles releasing each week so that means a bit of a bottleneck. We basically announced these games as soon as it was possible to do so, which means anything already in the pipeline is ahead of all six Mega Man Game Boy titles. He also confirmed the Super Nintendo title Mega Man X2 is a "likely candidate" as it was released on Wii Virtual Console, though he has no further update on that development just yet. Are you looking forward to these titles emerging on the eShop? Let us know in the comment section below. The more 3DS VC games, the better. busy? hasn't been bust at all so far, maybe Nintendo says busy because they're bringing better VC games and N64, sega consoles, gamecube to VC perhaps? Hopefully we are almost finished with the Nintendo "black box" games bottle neck. So basically, i'm going to have to wait until 2015 to get my MMV fix seeing as how Capcom spreads their releases out wider than a fat fudging phantom. "These are just a handful of titles in Nintendo's busy Virtual Console schedule." ...Nah that cant be it. "There are new titles releasing each week so that means a bit of a bottleneck." I think he accidentally used a plural there. We are talking about the 3DS' VC service here, which got 2 releases in the last 5 weeks. This is good news. I will buy all these to have on me at all times to play just for the ability of saving anywhere w/o using those long a$$ passwords! VC is so poorly managed...I mean Golf, Tennis, and Urban Champion? Seriously?! @Fast_45er: What do you mean?! Everyone wants Golf, & Tennis for the millionth time! X2 "possible" ? Whats the big deal about releasing these games ? I know that they cant just put them out all at once (longlivety concept of the VC bla bla) but this game already ran on the Wii VC, there shouldnt be any problems releasing it. X3 on the other hand could be a bit more problematic for the same reason, that yoshis island never saw the light of day on the Wii VC: The SuperFX Chip. @Metroidlink I'm pretty sure he means MegaMan X2 is a "likely candidate" for the Wii U vc. Please note that what he's saying is what people have been saying since VC first launched on the Wii. Just so the youngins aren't confused. This is Nintendo's policy that they've been using for years...A ruinous policy that caused many to stop supported the Wii, granted, but until Nintendo figures that out, there's nothing we can do but scream. @CountWavula Final Fight and SNES Street Fighter II on Wii U disagree with that. We'll see X2 soon enough. Capcom hardly has many NES and SNES games it originally released on the Wii VC to rerelease on the Wii U VC. @Capt_N have Mega Man 5 and 6 been released on the WiiU VC yet? We never got X3 or MM7 on the Wii VC and that has always irked me a little. Also, give me Demon’s Crest! Are they serious? We had two Virtual Console releases within the past "FIVE WEEKS". Why type of fariryland world are they living in? There has to be another excuse, maybe they're confusing it for Japan, who gets two Virtual Console releases a week and is ten months ahead of us! Its Mega Man II - V on Game Boy, not NES. II - IV are very loosely based on the NES games with same bosses but different stage layouts. Companies like Capcom submit games they want to release to Nintendo then Nintendo releases them whenever they feel like doing so. Often, perhaps almost always, Nintendo won't tell the company when their games will be released until it is released. Really lookin' forward to getting my hands on Xtreme 2 again! @MegaManEP3: I was under the impression that for the 25th anniversary, Classic series 1-6 was on the WU, as well as the 3DS. I have been waiting for gameboy Megaman 2,3, 4 and 5 for 3ds eshop since it said last June. Grrrr. Final Fight, Final Fight II and Mega Man X2 are already available on the 'Wii's VC....How's about some new games for once? Seeing as how the Wii U VC only has one, ahem...Earthbound. I already downloaded X2 months ago and I'm not interested in the Final Fight series anymore, either way they've both been available on the Wii for years now. I don't understand why people are getting excited about playing the exact same games once again that were already realeased years ago on the Wii's VC? Personally i don't care for the Game Pad's OFF-play, so rebuying these again is just a waste. They'd look nice on there as a VC collection and that's it. Besides, I'd MUCH rather play VC through my Wii on an SDTV, no additional hdtv lag(Because SDTV tube tv's don't have any, thank god) except the present input lag that's already there through the emulations which is about 1 frame. Nonetheless, I'm glad to hear these games are coming soon on the pipeline. @CountWavula 2 games actually, Golf being the 2nd. XD I'm sure they will eventually get to new games once the backlog is done. Capcom like I said is nearly out of Wii VC NES and SNES games to rerelease on Wii U. @Angelic_Lapras_King Demon's Crest is one of the best games on the SNES. (Never rereleased up to now). Don't see why they cannot use the rest of the X Collection tweak them a bit and have them as eshop downloads. (If they are on Gamecube already the extra effort would be basically nothing). Capcom still has Gargoyle's Quest II, Demon's Crest, Mega Man 7, Mega Man X3, Mega Man & Bass(JAP SNES version) ect. I don't understand the hold up on FireBrand? they release the original on the GB, but completely skip the other 2. ? Same deal with Konami not relasing Contra Hardcorps & Castlevania Bloodlines, not to mention Splatterhouse 3. It seems like a slap in the face to 3DS owners that they're giving us the significantly downgraded GBC ports of the Mega Man X games when the system is more than capable of running the original SNES versions in all of their glory. There's no good reason that anybody should want to play Mega Man Xtreme over the real version of Mega Man X. Xtreme has worse graphics, controls, and music, but the worst part about it is the extremely low screen resolution. Mega Man X was originally designed to be displayed in 256x224 resolution, so cropping the viewing area down to a 160x144 window absolutely kills its playability. @accc - Really? I thought the music from Mega Man Xtreme 2 was much better than the SNES game. As for who would want them...I would. the system is more than capable of running the original SNES versions in all of their glory. Doesn't matter. Nintendo isn't allowing anyone to release SNES games on 3DS right now. There's no good reason that anybody should want to play Mega Man Xtreme over the real version of Mega Man X. You have to remember that the GBC regularly had ports of console games which were flawed in every way compared to the console version. It was more about getting a big name title onto the GBC than delivering an accurate port. Mortal Kombat 4, Street Fighter Alpha, Resident Evil, Grand Theft Auto, Tomb Raider, Duke Nukem... all came to GBC. 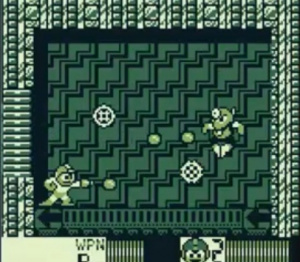 Even Super Mario Bros. DX couldn't manage the same screen resolution as the NES game. Its not like these days where we can expect a decent version of a console game on a handheld. But those GBC games can still be enjoyed and would be worthy downloads as long as you're not expecting the same experience as its more well known console version. Except Mortal Kombat 4 - that really is terrible even for a GBC game. @accc I quite enjoyed the Xtreme games, especially the second one. I sold them out of necessity, but I'd happily rebuy them. Looking forward for Mega Man Xtreme. I already have all of these games. I'm not buying them again. I want something new. I already have all of these games. They're not the NES games. They're the GB games. Are the Mega Man GB and GBC titles challengingly difficult like the Mega Man Zero games for GBA? Easier? Mega Man X2 isn't just a likely candidate...it's already out on the Japanese Wii U VC! Just another example of companies acting like we don't have easier access to the overseas release schedule than ever before...pathetic. @Einherjar As far as I know X2 and X3 Both use the same coprocessor and it is not Super FX. (Cx4). Not sure Nintendo they are bothered about as close as possible either. (As close as possible should be at least as good as the most accurate amateur created emulator. Taking into account they have such things as the hardware specs / VHDL (Or Verilog if they use that)). (They use those awful filters on the newer games / Don't output only at 480i to get the scanlines (Like e.g Neo Geo does) / N64 is not really even a good approximation. The Water effect which was one of the most visually stunning parts is not right). @unrandomsam I looked it up, your absolutely right on X3. I always thought that it uses the SuperFX chip instead of the Cx4. So, it shouldnt even be that big of a problem then to get this game working. I cant say much about N64 emulation. Although i loved the system, i havent played it nearly enough in recent times t make valid comparisons (no working controllers :/ ) But the N64 was, considering some dev interviews, development hell. So its no wonder that getting the emulation spot on is pretty difficult. As far as i know, the N64 and Segas Saturn are the two most difficult consoles to emulate because of their unusual architecture. I'd rather they resurrect "Mega Man Mania", the Anniversary Collection of Game Boy titles that was supposed to feature full color remakes of I-V.
i wonder if this will drop the price for MM V ? it goes for around 70-90$. The Blue Bomber is back, lets get some new games Capcom. We've already played the old ones... over and over and over again. Now you want us to buy them again on a new console? Ok I would be glad to, these are grrrreat!